Nucleus hives, or Nucs, have become a widely popular way for beekeepers to populate their farm. These tiny colonies allow for beekeepers to create established hives quickly and efficiently. Read on to learn why Nucs have been considered one of the best options for buying new bees. A Nuc hive is a miniature colony of a few thousand honey bees specifically created as a sort of ‘starter’ hive. While packaged bees are gathered from a variety of different hives, bees from a Nuc have an already established hive system in place. Nuc hives are packaged in 2-5 frames that can be installed directly into a hive and contain honey, pollen, and all stages of brood. How are Nuc Hives Made? Once a hive grows large enough, about half of the bees will begin to split off into smaller groups known as swarms. These swarms contain a small offset of their mother colony, complete with a Queen ready to build up her own hive. Established beekeepers use this natural process as a means to create Nuc hives, which take advantage of swarms looking to expand their colony. Nucs are built into a single 5-10 frame hive box, along with the essential inner and outer covers to keep the colony safe. To fill a Nuc, beekeepers will carefully sort through their established bee hives to look for a few frames that are filled with pollen and honey. They will use these frames as a kick-off point for the Nuc colony. A small percentage of bees from the original colony is then moved into the Nuc box, where they can once again start working to establish their colony. After a few weeks, a completed Nuc can be shipped out to other beekeepers looking to populate their own hives. Familiar with the Queen: One of the most obvious advantages of a Nuc is that the worker bees are already familiar with their Queen. This relationship is important to the production of brood and cuts down the time it takes to get a hive established. Brood at All Stages of Life: Nuc hives come with brood from every life stage, allowing the colony to grow quickly one installed into the hive. More bees mean more honey. Already Producing Honey and Pollen: While packaged bees have to start their production from scratch, Nuc hive bees have the benefit of an already established comb structure that allows them to immediately begin producing honey and pollen. Foraging Starts Immediately: Bees that come from Nucs will be able to start foraging immediately. Nuc bees will be able to find food on their own and won’t need constant feeding from the beekeeper. Can Establish Full Colony in a Few Months: With the bees in full production right from the Nuc box, a colony can be established in as little as a few months. This means less work for the beekeeper, and a quicker payoff when it comes to honey harvesting. 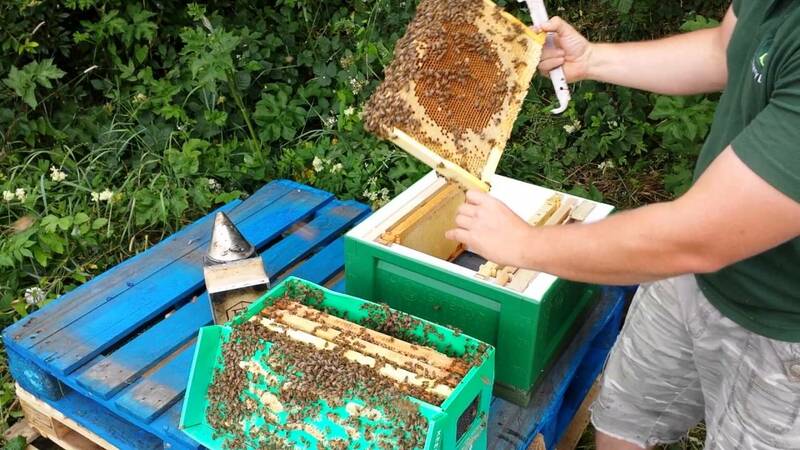 Easy to Install: Nuc frames fit directly into any standard sized Langstroth box, making it easy to place them inside your new hive without having to shake them out. While the advantages of Nuc hives outweigh the disadvantages, there are a few key factors that may prove too challenging. Not Readily Available: Due to the time it takes to establish a colony, Nucs are usually not available until mid to late Spring. This can be a downside for those looking to start their hive earlier in the season. More Expensive than Packaged Bees: Nucs cost between $50-$100 more than a package of bees, making them the priciest option for buying bees. Contamination: Comb that has been transferred from another hive may harbor a variety of different pests and diseases that can be spread across your hive. 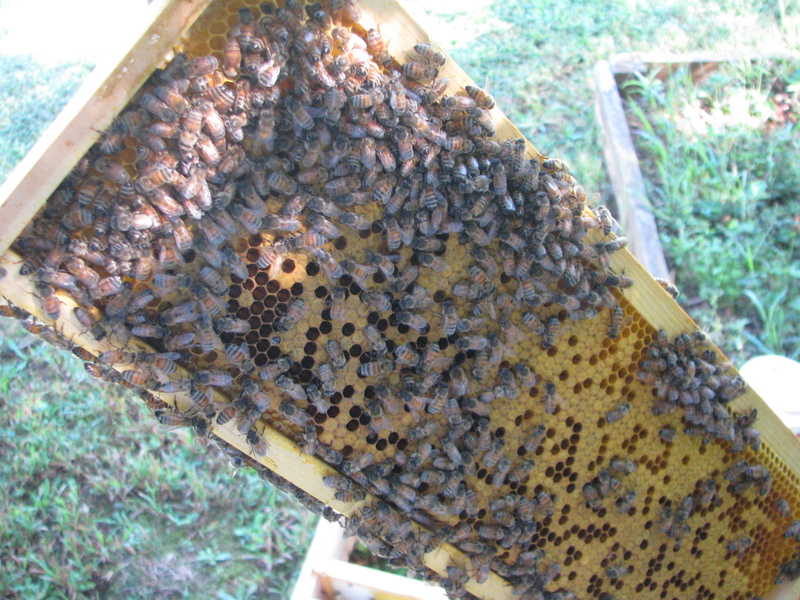 Be sure to only buy Nuc hive boxes from a reliable source to avoid potential contamination. Hive Design Constraint: Most Nuc boxes are built with standard Langstroth frames, which can only be installed into a Langstroth frame. Beekeepers that prefer a top-bar hive may have a difficult time finding a Nuc that will fit. Installation of a Nuc hive box is a relatively simple procedure that can be done in a matter of minutes. To prepare your hive, remove about 5-6 frames from the center of a hive box to allow space for the Nuc frames. 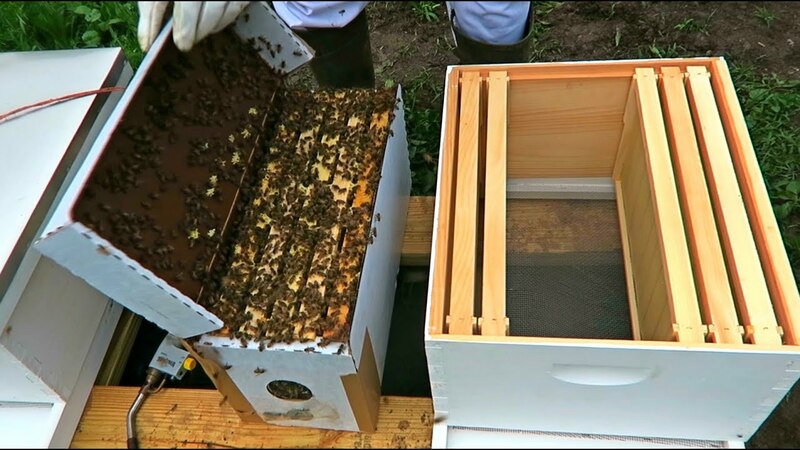 With the Nuc box placed next to your hive, remove the cover to gain access to the frames. It’s recommended that you use your smoker to keep the bees calm during transfer. Remove the Nuc frames using a hive tool, starting with one of the outer edges. Once removed, carefully place the frame into one of the empty spaces in your hive box. Repeat this process with the rest of the frames, making sure you place them into the box in the same order you took them out. Once installed, add any additional frames needed to fill the rest of the box and put the hive back together.